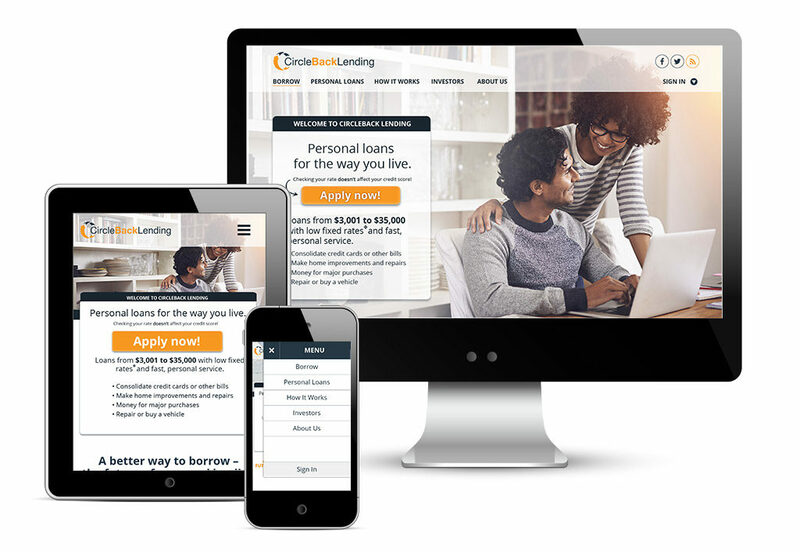 As part of an emerging start-up, I was responsible for coordinating the design of a revamped website that conveyed the new brand and increased conversion. Additionally, I coordinated with the front-end development team to ensure that the design was implemented as intended. #HuntEVV was promoted across multiple social media platfoms, attracting attention across the Tristate area to establish a highly successful inaugural event. 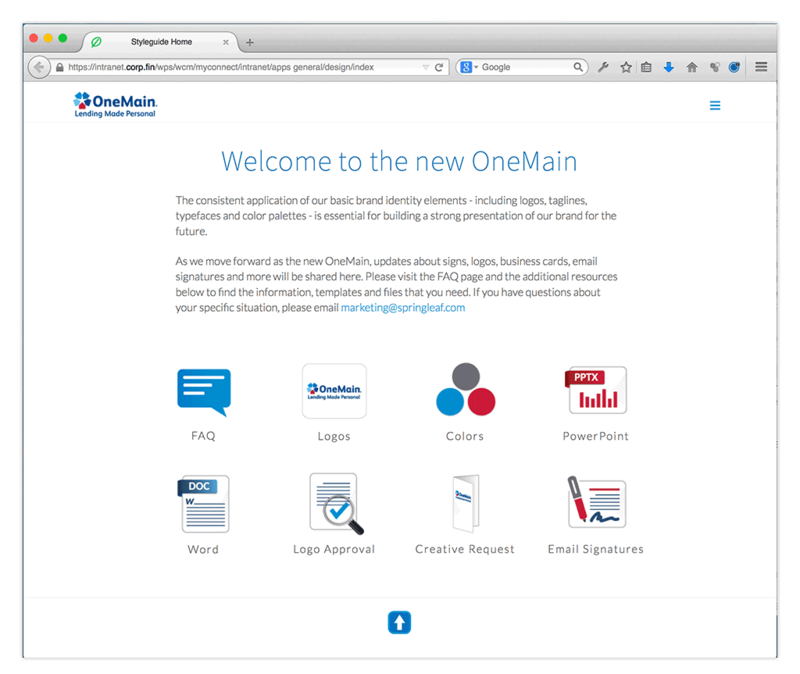 In order to facilitate the Springleaf Financial and OneMain Financial merger, a plan for integration was developed including the cobrand lockup (above), a concise user guide for users to aid in explaining the interim brand, and an online portal to facilitate the distribution of new OneMain branded assets. 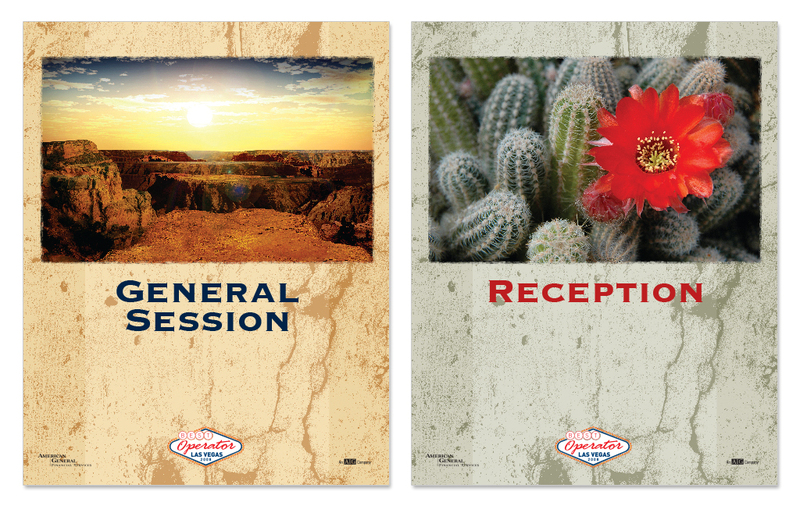 The primary goal of all materials was to incorporate clear guidance on everyday design issues. Decisions regarding standards were made thoughtfully, considering both brand goals and the practicality for end users. 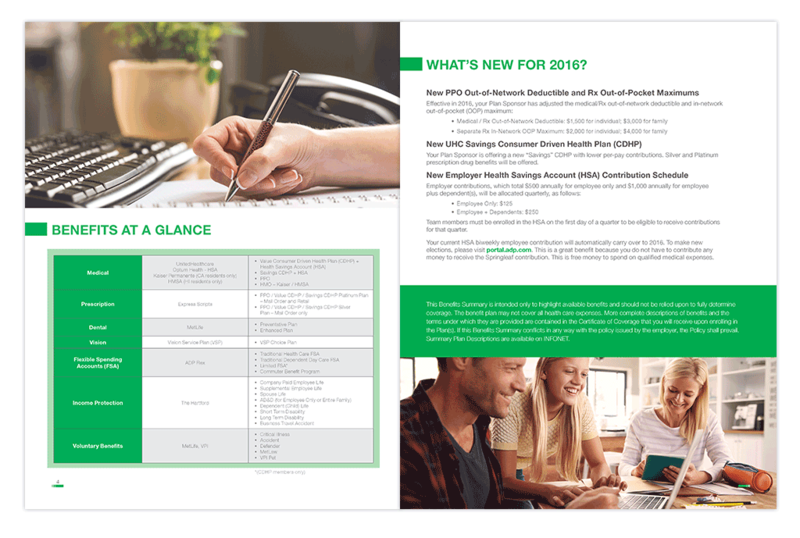 The annual benefits guide was challenged to make employees feel good about their benefit options in a world where the cost of those benefits is steadily increasing by choosing uplifting lifestyle images and proving the content in a straightforward manner. 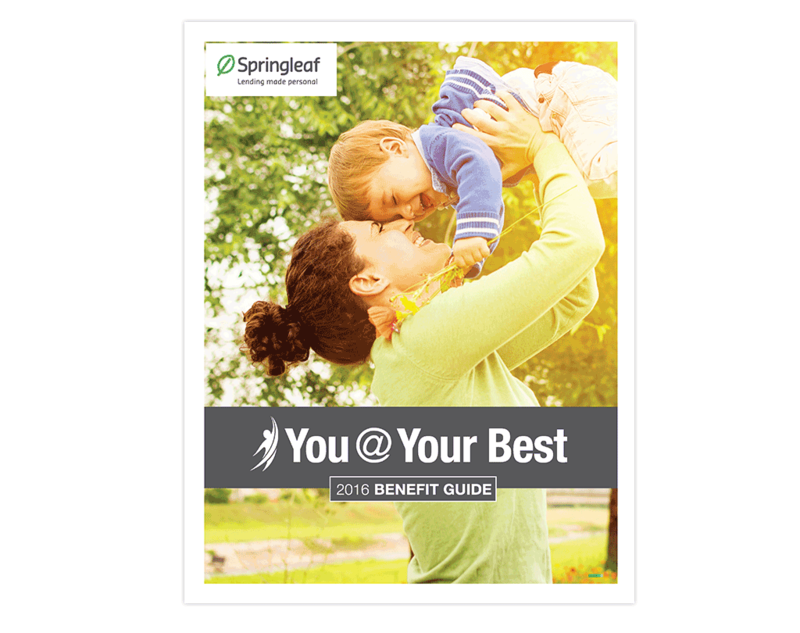 Multiple versions of the guide were required to cover the variation in benefits for different company brand units. 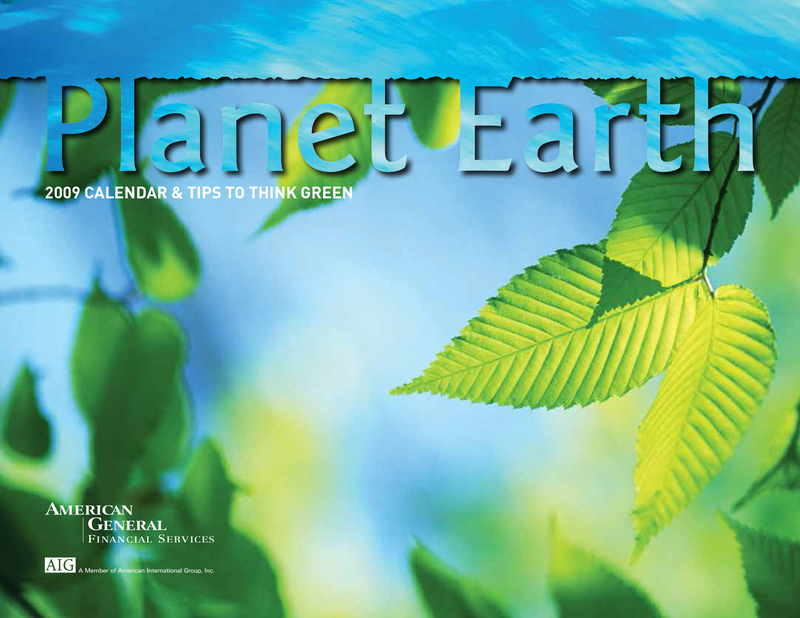 Additionally, as a cost savings and environmental decision, the guide was deployed as an electronic document only. 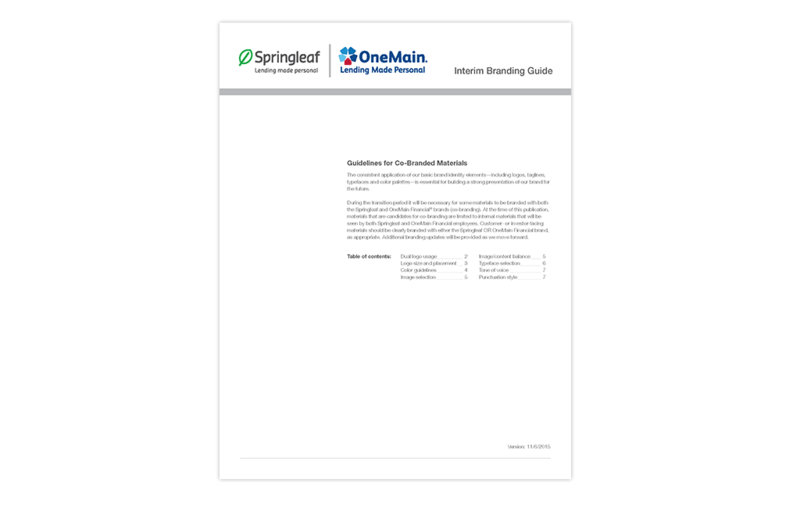 Due to privacy constraints, only a sample of the guide is provided below. 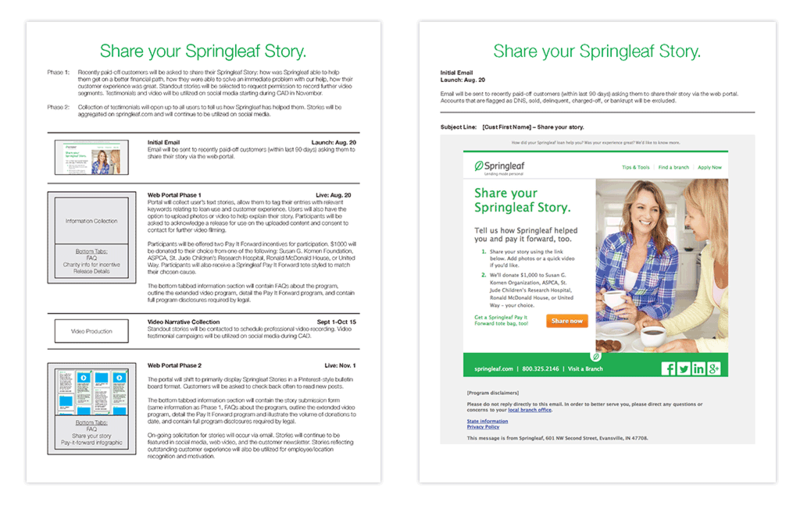 The team was presented the challenge of delivering a plan to rapidly solicit customer testimonials about their experience with Springleaf in preparation for a planned brand campaign. 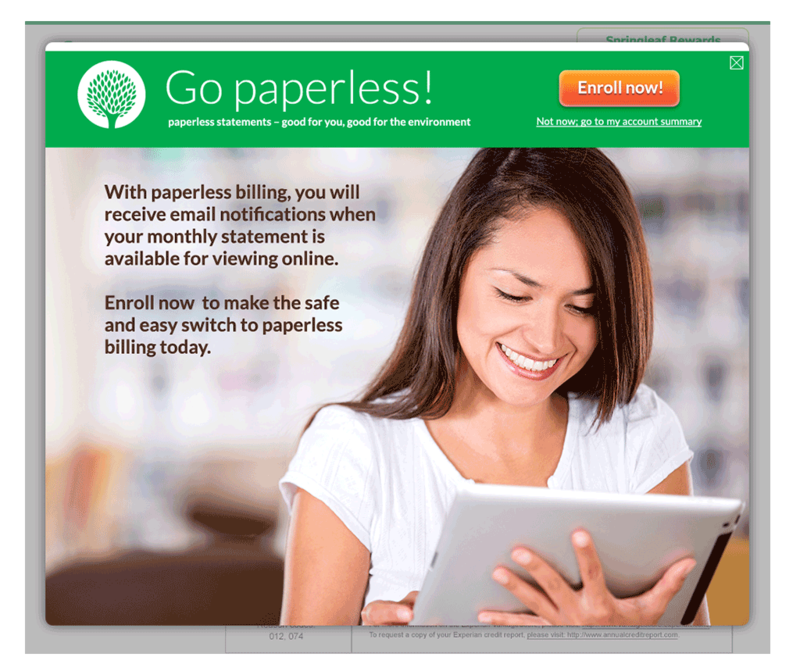 The proposed plan of action included a low-effort deployment of a targeted email offering a user-directed donation as an incentive for responding. 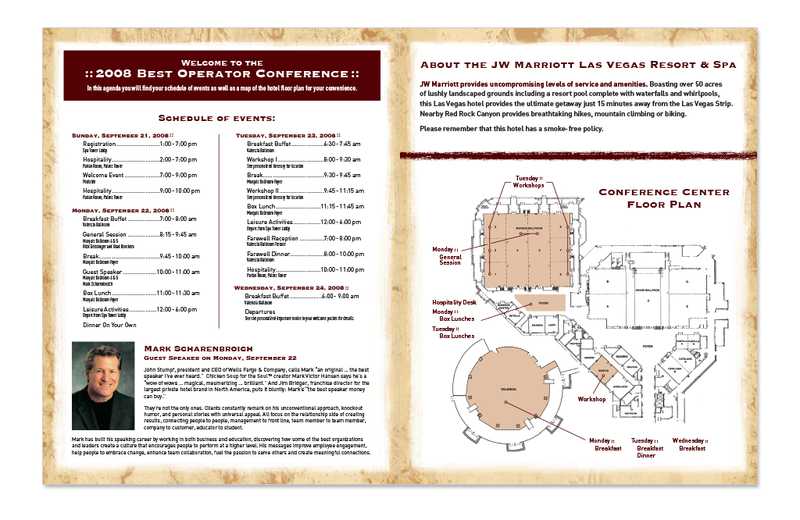 A long-term plan for utilizing the responses via social media and corporate website was presented as an add-on to the original brief. 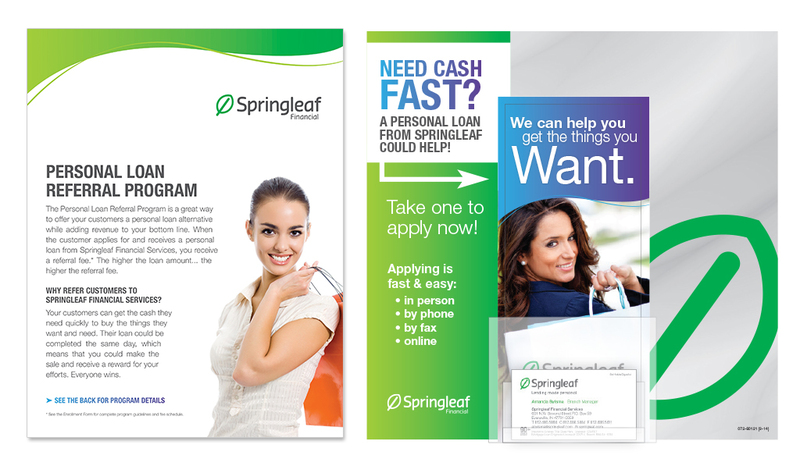 The Springleaf loan document envelope was developed as a packaging solution for the branch network. 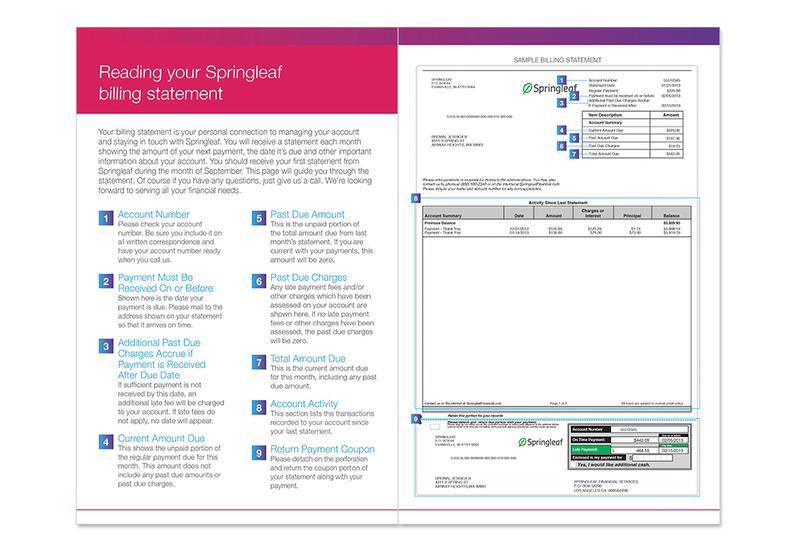 The closing paperwork that new accounts received had exceeded the capacity of the traditional trifold-size folder so a customer, large capacity envelope was designed. 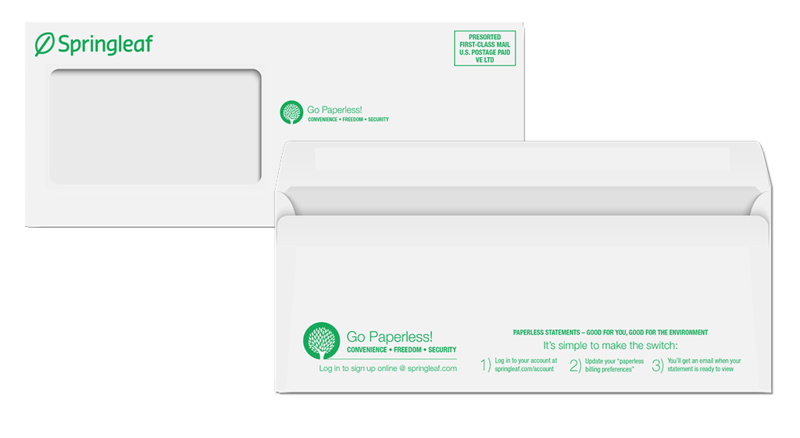 The document envelope creative was designed to convey the core business value of customer commitment. Additionally, an invitation to participate in a customer satisfaction survey was added to capture data at a favorable point in the customer life cycle. 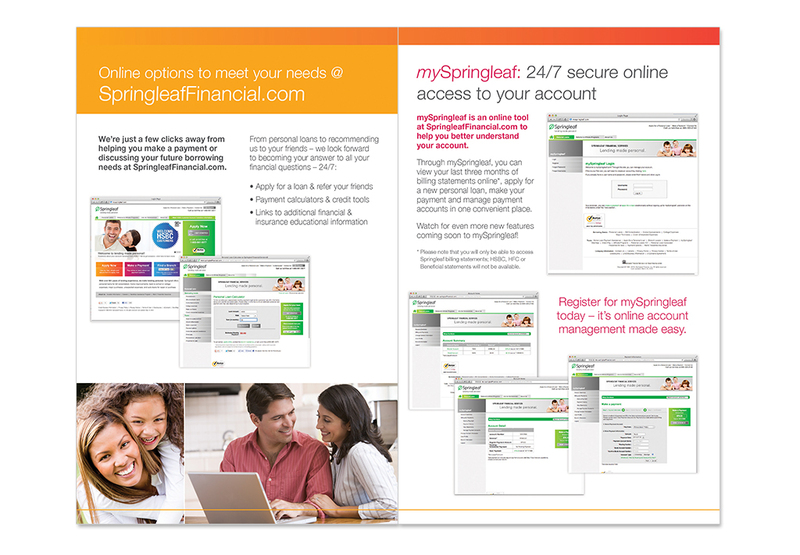 Updated branch store front brand messaging variations were tested in incubator locations and ultimately rolled-out to the full market. 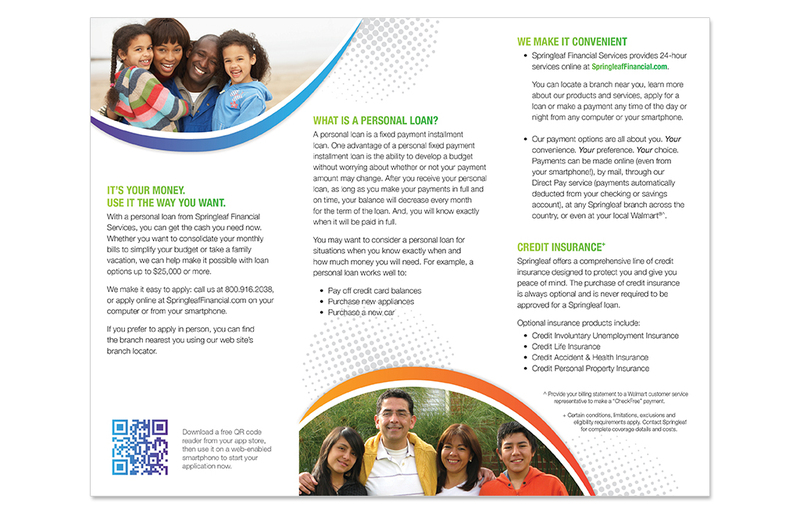 The monthly Connections newsletter was developed to provide timely information about new programs, customer benefits and financial tips to customers. 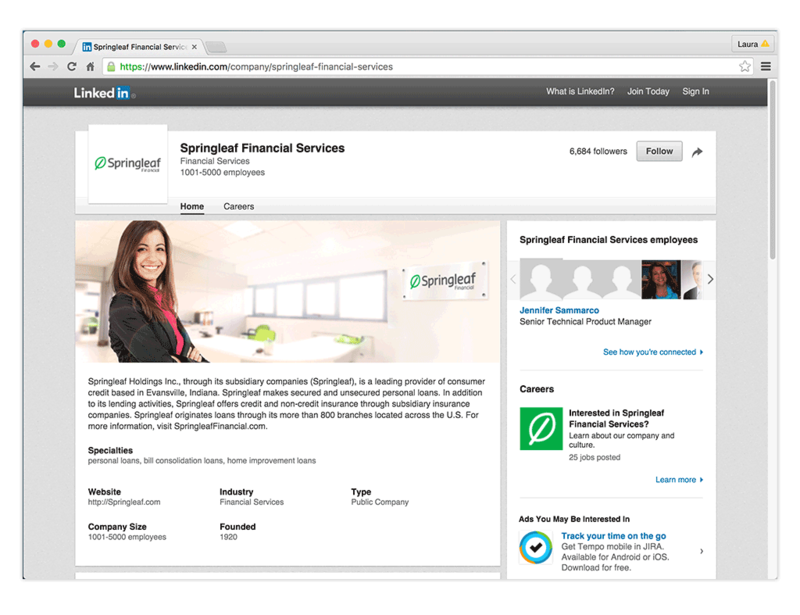 I was responsible for the implementing and maintaining a cohesive brand presence across all social media platforms, including the LinkedIn roll-out of a more visually responsive design. 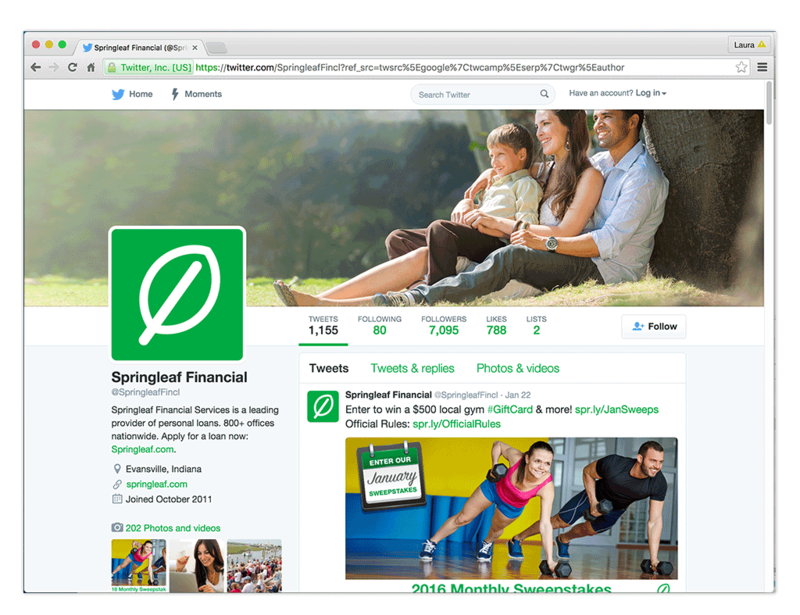 I was responsible for the development of the company’s Twitter presence from launch, and subsequently for the maintaining a cohesive brand presence across all social media platforms. 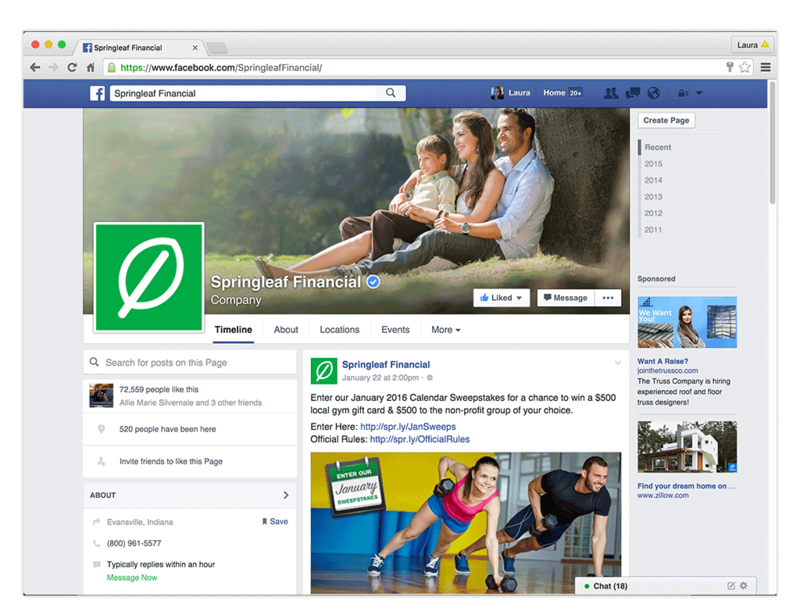 I was responsible for the content development and application programing of the company’s Facebook presence from launch, and subsequently for the maintaining a cohesive brand presence across all social media platforms and messaging. 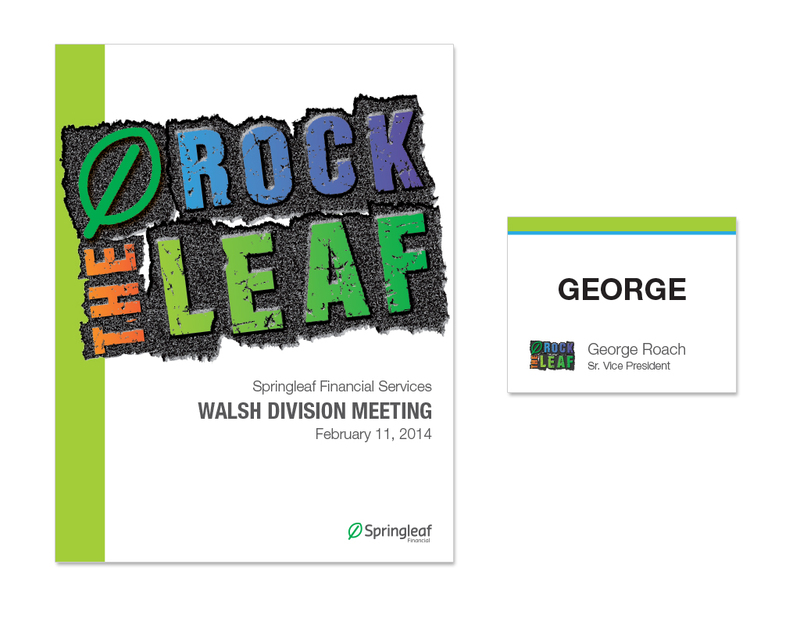 The annual complimentary calendar has become one of the most popular pieces with Springleaf customers. 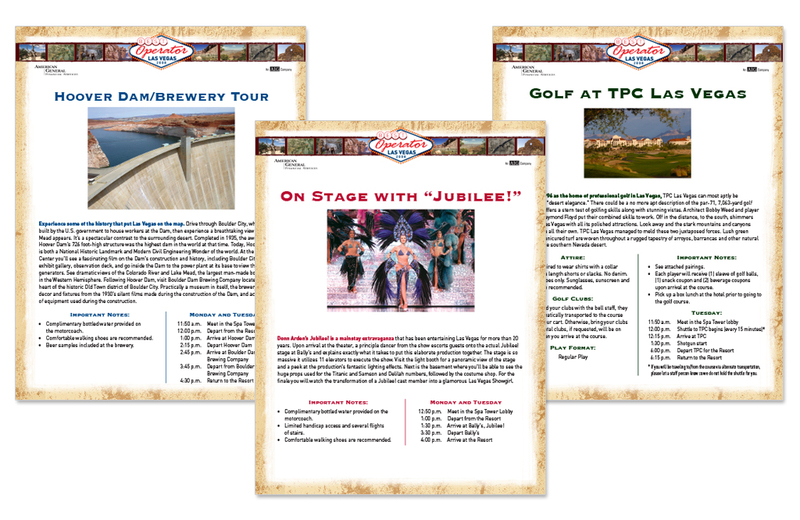 Customers regularly write/call to compliment the design, often requesting more information on the images selected. 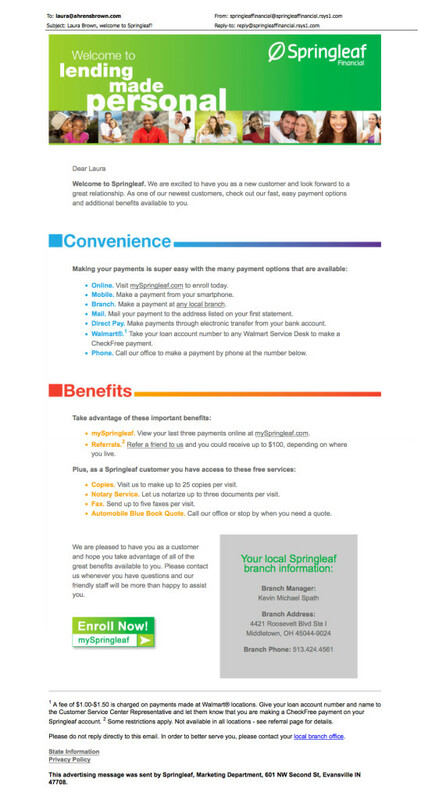 Selecting a brand-appropriate theme that a wide demographic range can enjoy can be difficult: customers come back to the branch year after year with certain expectations and the design must fulfill their needs. After all, why create a free calendar that no one wants? The purpose is a 12-month top-of-mind presence on their refrigerator. 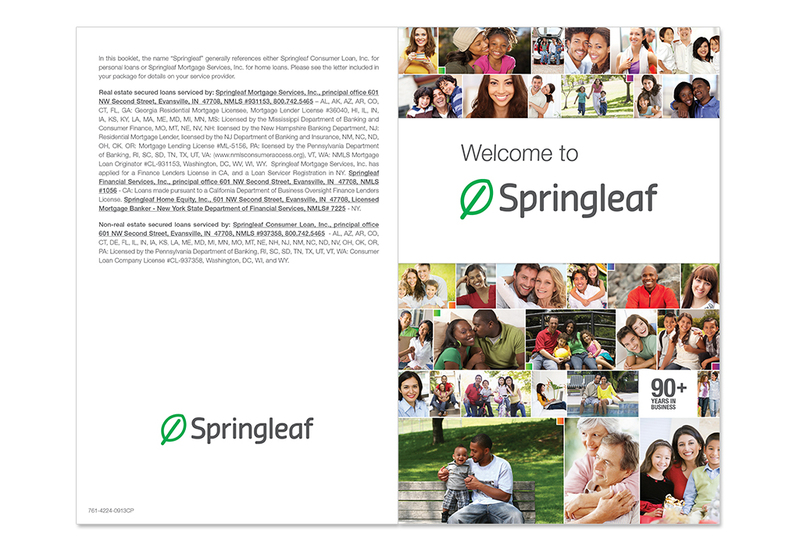 The capabilities brochure was developed as a brief company introduction. 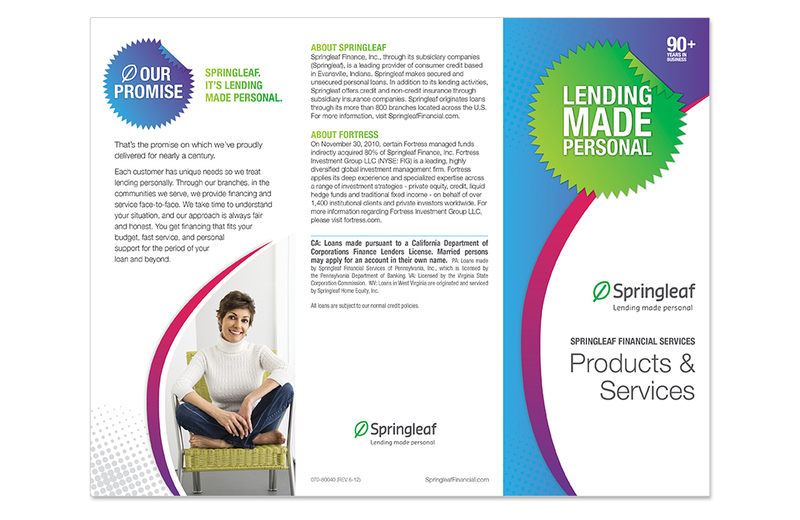 The brochure is displayed in Springleaf branches for walk-in customers. 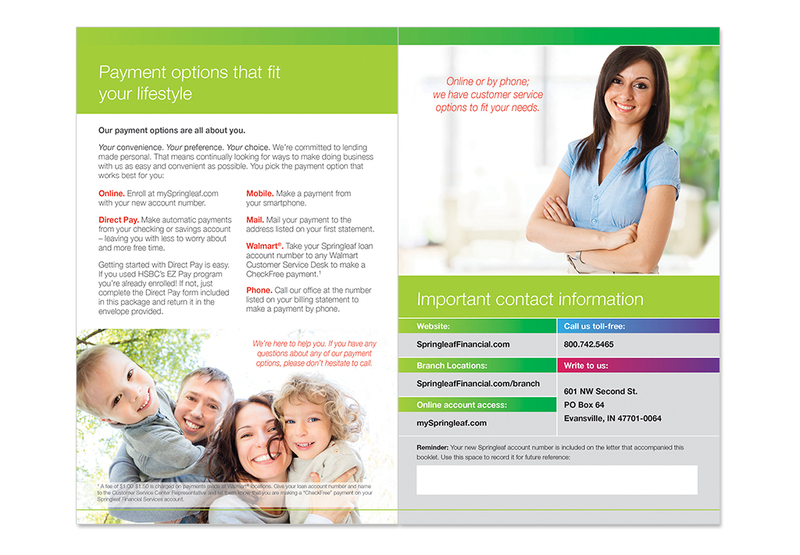 The brochure highlights customer benefits, branch and online services and insurance product availability. 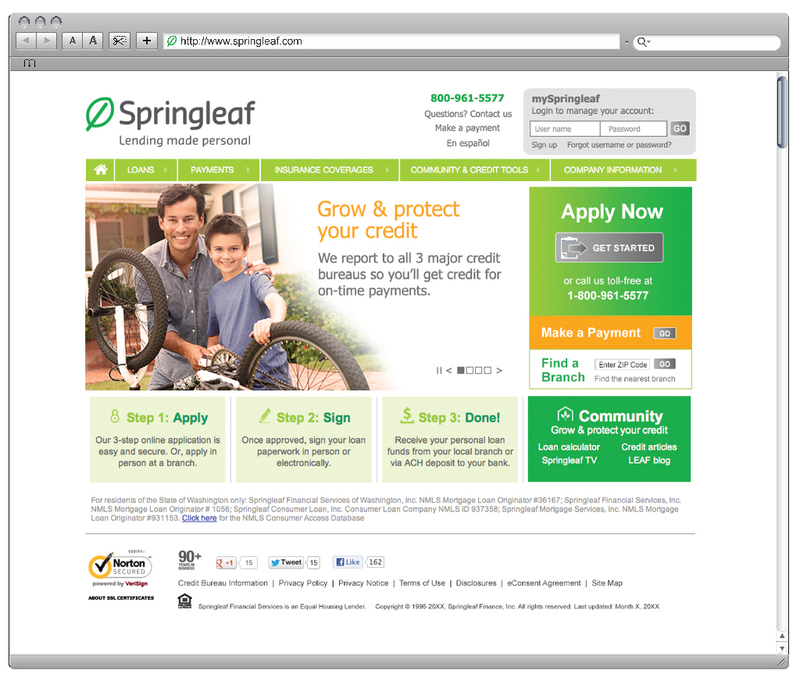 Springleaf.com is the company’s primary digital acquisition tool. 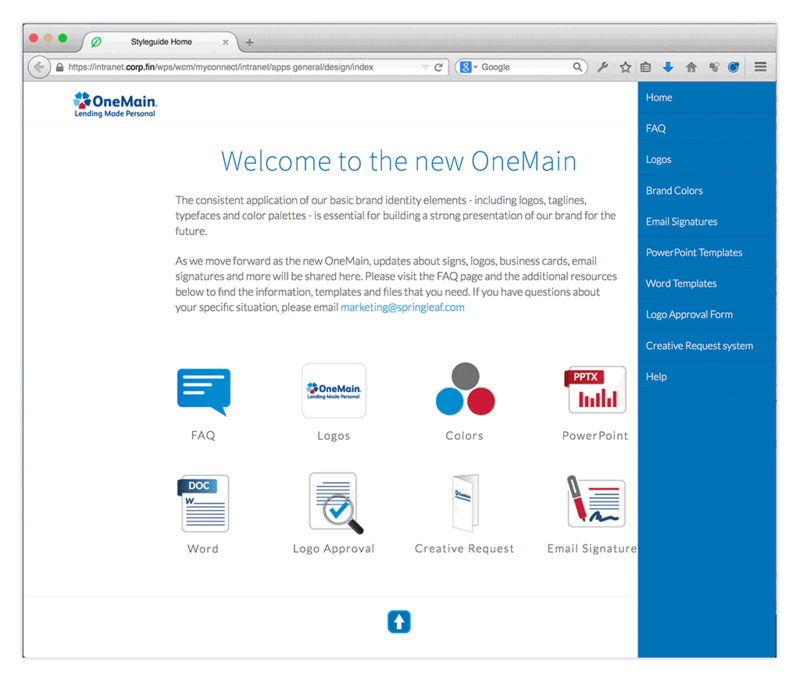 The site has evolved from a simple informational page to a fully functional eCommerce platform. The visuals on the site serve to reinforce the open and accessible brand image through clean navigation and warm image choices. 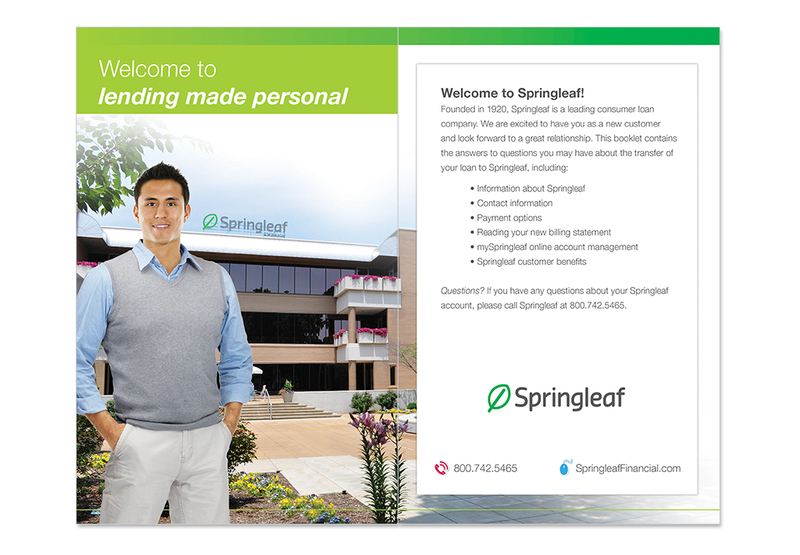 The welcome brochure was designed to and mailed to customers impacted by a large account transfer project. 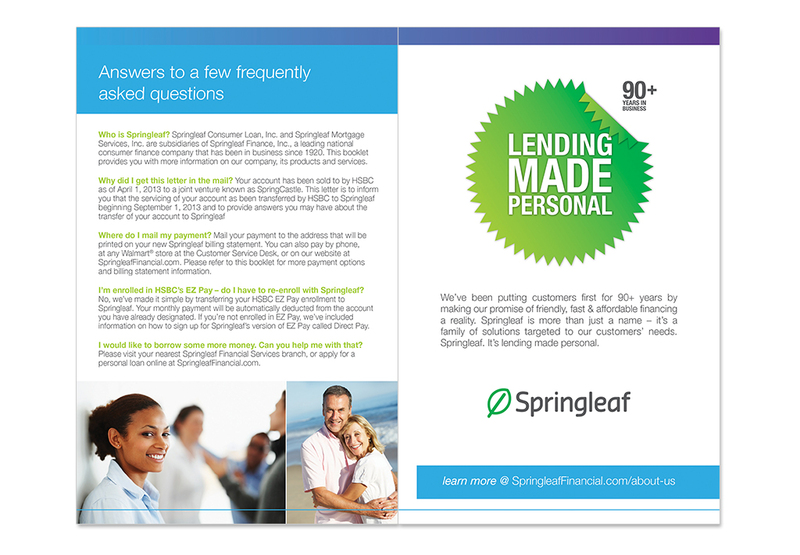 The brochure was part of a package notifying the customer that their account had been transferred to Springleaf from another major lender. Details included their new account servicing options, Springleaf customer benefits, springleaf.com website overview and a quick-reference guide with contact information. 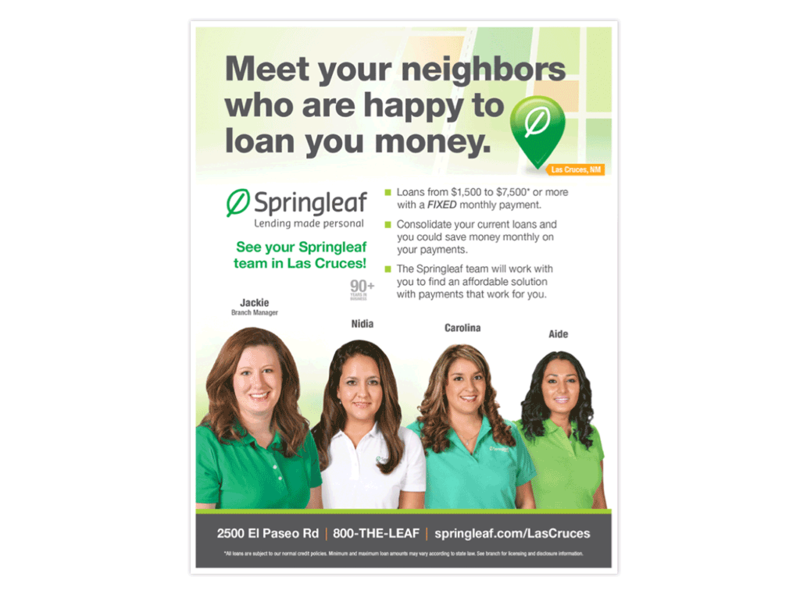 The Springleaf App for iOS was developed to support customer demand based on survey feedback and an increased need for market visibility. Working with dedicated contract staff, brought in to execute the project details under my art direction, allowed the app to be released to market in a very short time frame without compromising brand impact. 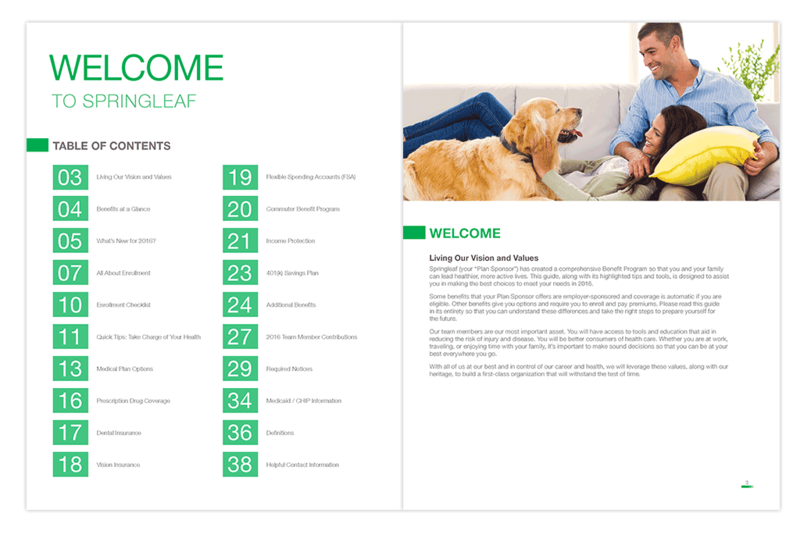 Welcome direct mail materials (printed and email versions) were developed to thank new customers for choosing Springleaf – recognizing that they have options in the marketplace – and to remind them of the benefits of being a Springleaf customer. 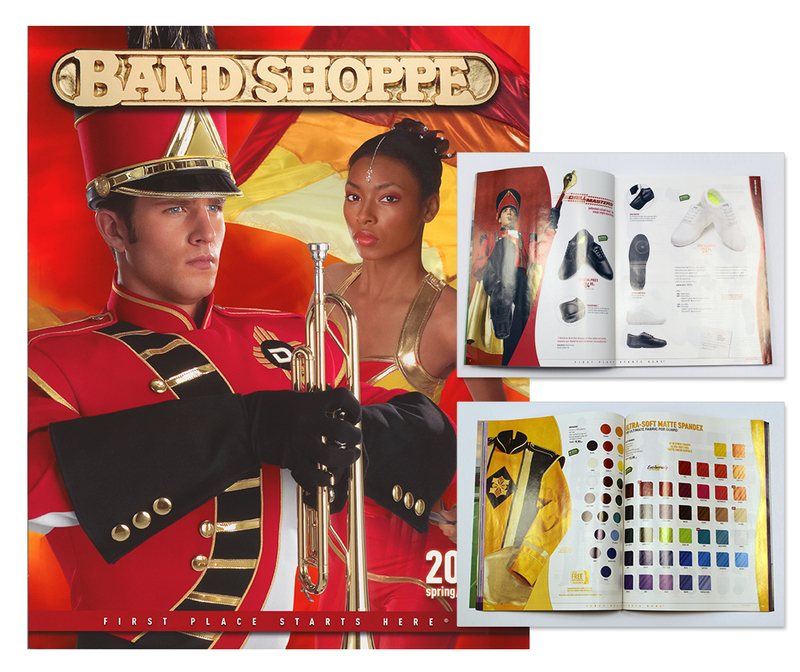 The annual Bandshoppe Catalog was the company’s primary sales tool. 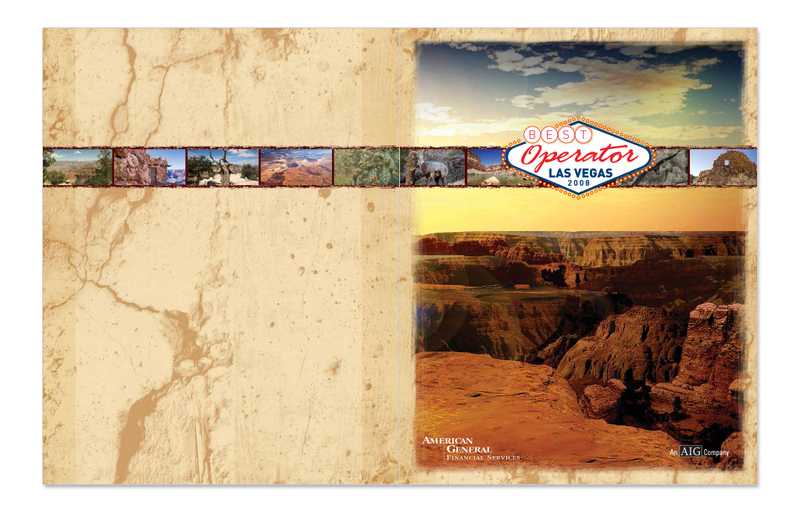 Distributed twice each year, with different covers to keep the design fresh, the catalog showcased the range of product lines offered. 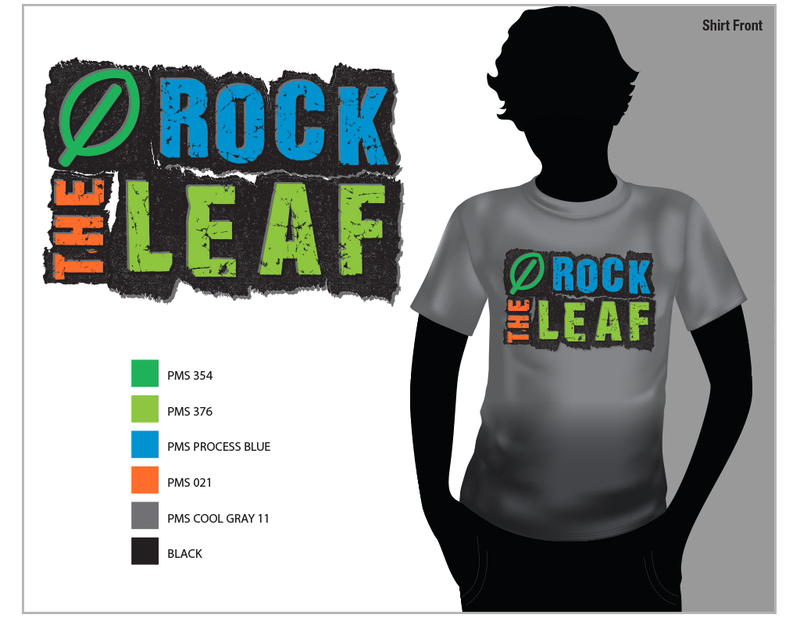 Decisions about featured products were made based on sales data as well as the need to showcase possibilities in a business that catered to custom-design needs from many customers. 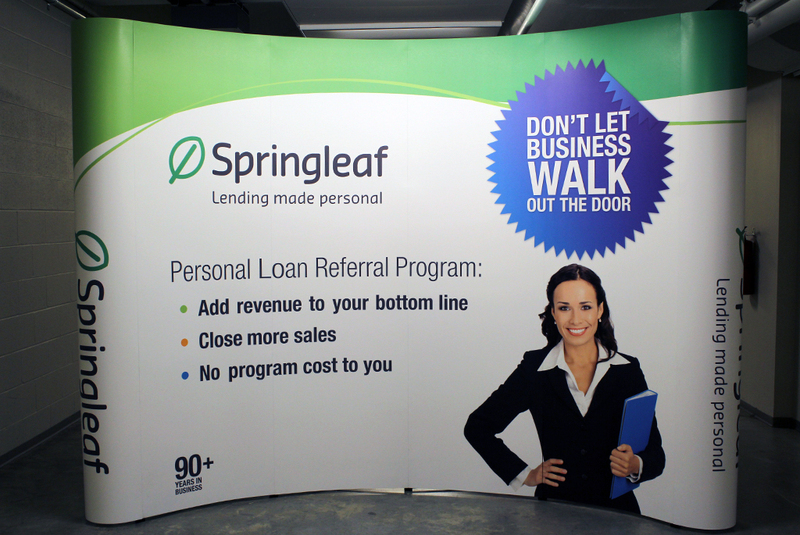 The Springleaf Referral Program trade show booth was designed to serve as a backdrop for Springleaf sales staff seeking merchants to participate in the loan referral program.